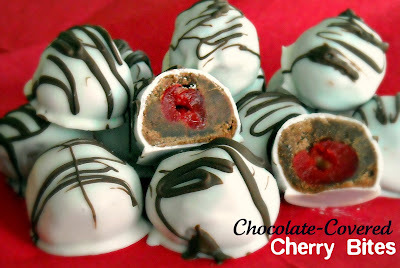 Cherries and chocolate are always a big hit- the best part is when you bite into one and find the cherry surprise! They are a fun (and easy!) treat for Valentine’s Day. Melt the squares of baking chocolate and add butter. Mix in powdered sugar, cherry juice, and vanilla. Add the flour and salt and mix well. Knead together into a dough. Pat dough tightly around each cherry, (make sure cherries are VERY dry). Bake at 350 for 12 to 15 minutes. Cool thoroughly. Melt white chocolate in microwave for 30 seconds and stir. Repeat until smooth and melted. Dip each cookie and allow to dry on cookie sheet lined with wax paper. Drizzle melted chocolate chips over the top of each cookie. Store in an air-tight container. I wonder if you could use butter instead of shortening? Just made these- but my "balls" flattened into little cookies. :( What did I do wrong?? These look great. I just found your blog for the first time tonight. I was drawn to the name of your blog because I have six daughters. We do have one son though. Looks like you girls enjoy each other. Family is such a gift. God bless. O-M-Geee these look amazing. I am totally making them tonight! I seriously love Chocolate Covered Cherries so I know I will love these. They are going in my Friday Finds this week, and I will be making them soon. Thanks for sharing. These chocolate covered cherry cookies look delish! My family loves chocolate covered cherries...I bet they'll devour these!